Create a grid 30 yds x 20 yds about 10 yards outside the penalty box. Each player inside the grid has a ball and an assigned number. In the grid, the players dribble and move until their number is called out. When a coach calls out a number, that player (Example #1) dribbles out of the grid into the zone in front of the penalty box and takes a shot. Once a player shoots, they retrieve the ball and return to the grid. When a players number is called out, they find space, play a one-two pass combination with the coach who is positioned at the top of the box and finish with a shot. Set up an area that is 36 yds x 48 yds. Divide the area in half. In each half there are four defenders and two attackers. These players must stay in their own half of the field. The four defenders look to maintain posession in their half to free themselves for shots on goal, while the forwards are looking to defend or re-direct shots as well as offering support and finding rebounds. -Defenders move the ball quickly to open up shooting opportunities. -Involve forwards for not only shots themselves but to open up space for the defenders to receive the ball back and shoot. -How can we garner more shots on goal? -How can we include the forwards to get more space and time for shots? -When should you shoot? When should you not? In a grid with the wide of the field and a length varying between 50 and 80 yards, depending upon age and numbers, create a channel on each side along the width of the penalty box. Teams will play 7 vs. 7. The team with the ball is allowed two palyers in the outside neutral zone while the defending team is only allowed one. This will create 2 vs. 1 opportunities on the flanks, enhancing wide play. -Move the ball quickly on offense to exploit open space in the neutral zones. 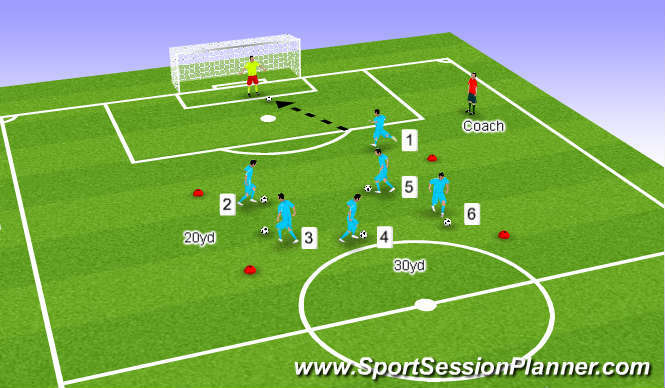 -Take full advantage of the 2 vs. 1 situations in the wide positions. -Proper technique when serving the ball from wide positions. -Decision making process as to when to take players on, when to cross the ball, and when to possess. In a grid similar in size, play 7 vs 7. Place two cones 25 yards from the endline and 20 yards from each sideline. A team can only conclude an attack on goal by first playing around the outside of one of the two cones. -Rather than requiring a team play around the outside of the cones, an extra point can be given to goals scored after playing around the cones. 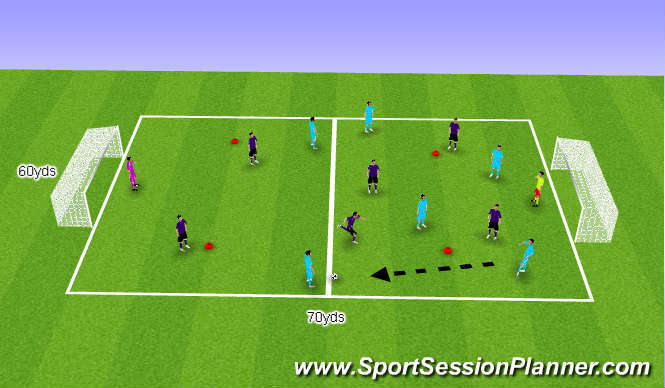 -Move the ball quickly from side to side to find an opening to play around the cones. -Stress the importance of possession and patience when the opportunity to play wide is not available, but when it is available, the team must take advantage quickly as to not let the window of opportunity close. -Proper team shape to exploit the width of the field.